We are still not getting spring here and it is making me a little stir crazy. So I thought I’d post this springy/summery recipe. I served this at book club and the butter was mistaken for cheese because it is just that tasty. Here is a picture of this with a couple of cheeses as an appetizer platter. You could also use some nice thinly sliced whole-wheat bread to make open-faced sandwiches for lunch. You’ll want to use the butter on everything, and should. It would be great if you steamed or roasted veggies and then tossed a little of this on it to finish them off. 2-4 T Chopped fresh herbs – like chives, thyme, rosemary, dill, tarragon, parsley. Whatever is fresh and you can get your hands on. You can do just one or any mix that smells good to you. I like chives and dill, but pick out what you like. Altogether, you’ll need at least a couple of tablespoons. Soften the butter by leaving it on the counter for about an hour. Using a mixer, whip the butter until it is fluffy. Mix in the salt. Mix in the herbs. Taste the butter and see if it tastes good to you. If not, add more salt and/or herbs. Put the butter in a serving bowl. You can use it right away or put it in the fridge. It will harden in the fridge, but if you want it fluffy later on, just make sure you take it out of the fridge in time to resoften before using. Slice the radishes thinly. Slice the baguette. 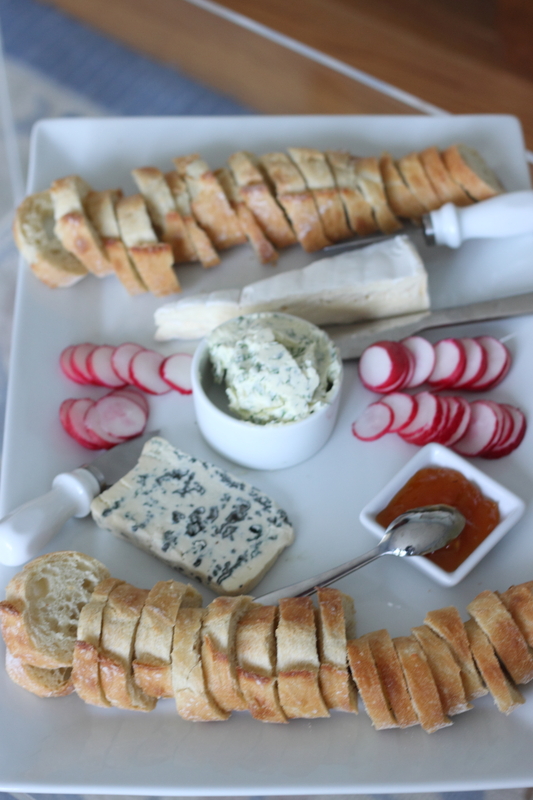 Arrange the butter, radishes and bread on a platter. Guests butter and top the baguette slices themselves. If you want this to be a passed appetizer, you could do that ahead of time and serve all ready on a platter.